The modern world moves at a breathtaking pace, even when most of us find ourselves on holiday. No sooner do we receive, read and start to digest one set of economic data than we find ourselves pushed to think about what the next set will look like. The clearest recent illustration of this undoubted reality is to be found in peculiar twist of events which meant that just as the news reached us that the German economy had expanded at a record rate in the second quarter, at almost the very same moment Federal Reserve officials meeting in Washington decided to significantly downgrade their economic outlook for the United States, saying the â€œpace of recovery in output and employment had slowed in recent monthsâ€ and was likely to be â€œmore modestâ€ than anticipated in the near term. But this followed a month of May when it seemed Europe’s economies were on the brink of disaster, while over in the United States some sort of recovery was on the cards. So what is going on here, does the earth switch itâ€™s magnetic pole every six months, with what went up last time round now going down? Or could it possibly be some kind of common thread here, one common factor which unites the unprecedented expansion we have just seen in Germany, and the fears of renewed recession in the United States. Well, as it happens, indeed there could, and it has a name – the Greek debt crisis. 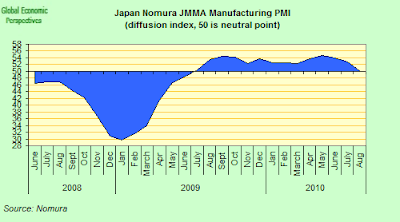 And with the rise of the dollar the global economy started to fall back into dangerous – pre crisis â€“ habits. The US trade deficit started to open up again, and one exporting nation after another started to see yet one more time the US market as the global economy’s consumer of last resort. Indeed the US June trade statistics reveal the extent to which American consumers are once more sucking in large quantities of imports as their spending power recovers, while weak demand in the rest of the world coupled with the comparatively high dollar has been keeping a brake on American exports. As the New York Times put it in an editorial, “China is mopping up demand everywhere you look with its artificially cheap supply of goods, while Germany, the worldâ€™s other exporting power, is cutting its budget and relying on foreign demand to drive its economic rebound. This isnâ€™t sustainable”. And the numbers prove the point. The United States trade deficit ballooned to $49.9 billion in June, the biggest since October 2008. In July, one month later, China recorded a $28.7 billion trade surplus, the biggest since January 2009. In the first five months of the year, Germanyâ€™s trade surplus, driven in large part by demand for machine tools in recovering Asian economies (many of them busily sending exports to the US), rose 30 percent compared with 2009. And this impression is only confirmed when we come to look at the latest revision for US GDP in the second quarter. According to the revised data, US GDP increased at an annualised 1.6% rate (as compared with the 9% annual rate in Germany), after registering a 3.7% rate in the first quarter, according to the Bureau of Economic Analysis (BEA) today. The second-quarter growth rate was revised down by 0.8 percentage point from the â€œadvanceâ€ estimate (of 2.4%), in part as a result of the new data on imports for June. The US Bureau of Economic Analysis report stated that slower GDP growth primarily reflected a surge in imports compared with the previous quarter and a slowdown in inventory investment. In fact, real exports of goods and services increased at a 9.1% rate in the second quarter, compared with an increase of 11.4% in the first, while real imports of goods and services increased by 32.4%, compared with an increase of 11.2% in Q1. Meanwhile the German economy turns in a 2.2 per cent quarterly growth spurt, unified Germanyâ€™s best-ever performance. The annualised 9 per cent growth rate, is, as the Financial Times noted, virtually unprecedented in developed economy terms. Such dramatic changes, rather than reassuring us that all is well, only lead to even more doubts. Is it really desireable for an economy to shoot forward so dramatically, only to fall back again in the second half, which is what almost everyone (Monsieur Trichet included) expects to happen? Not only does the German performance seem exaggeratedly large, at the other end, on Europe’s periphery, the result was lamentably small. Greece naturally exceeded everyone’s expectations, on the downside, with a 1.5 per cent quarterly contraction (a 6 per cent annual rate), but Spain remained at the bottom end of the range, with a 0.2 per cent expansion, as did Portugal. Undoubtedly the Greek contraction will slow as the year advances, but the outlook there continues to be preoccupying. 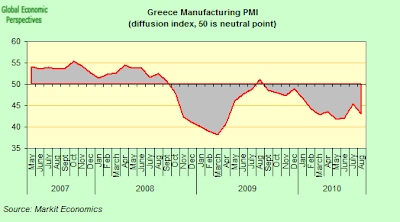 Only today the Greek manufacturing PMI, which showed the contraction in Greece’s industrial sector accelerated again in August, has reminded us of just how difficult it is going to be for the country to return to growth, and especially if the external environment now starts to deteriorate. 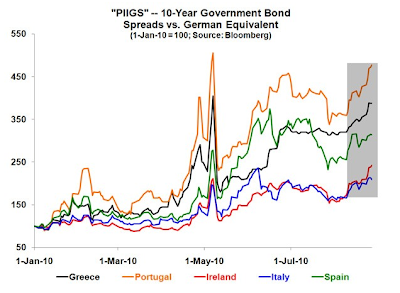 As the FT’s David Oakley said yesterday, in many ways Germany could be said to have had a “good crisis”, since the Greek issue pushed the Euro down and German exports up, while the current flight to safety is driving down the yield on German bunds to record lows even as it pushes up the spreads for peripheral Europe sovereigns. Among other imapcts this gives German companies an even greater competitive advantage as their capital costs come down even while those for their competitors go up. Spreads â€“ which are the additional borrowing premiums countries have to pay over benchmark Bunds â€“ hit a fresh record of 357 basis points in Ireland this week, following problems in Allied Irish bank and a Standard & Poor’s downgrade. 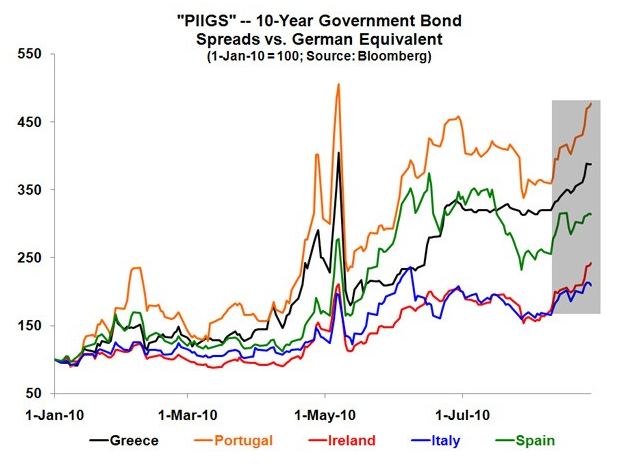 In Portugal and Spain, spreads have been creeping back up, and are now once more close to their all-time highs. Spainâ€™s 10-year bonds are trading at about 192 basis points above Germany, compared with 57 at the start of the year while Portugal is trading at 333 basis points, compared with 67 on January 1. The following chart shows how peripheral spreads have evolved since the start of the year (they have been indexed to 1st January). As is evident they shot up in May, then came down to lower levels in July, but during August they have once more been climbing. All three economies are experiencing extremely weak growth and Ireland is even flirting with deflation. Higher government borrowing costs can harm economies in a number of ways, from higher borrowing costs for companies to added pressure on a countryâ€™s public finances as more is eaten up in interest charges, leaving less for public services and stimulus. Effectively the presence of a large spread differential means that monetary policy is applied unevenly across the Euro Area, despite the “one size for all” objective of the ECB. And doubly so with a credit crunch which means some banks struggle to finance as a backdrop. And as if all of this wasn’t enough, Germany’s main competitor in Asia (where German exports have been clocking up large increases) has been effectively KO’d by the flight to safety produced by the Sovereign Debt Crisis. 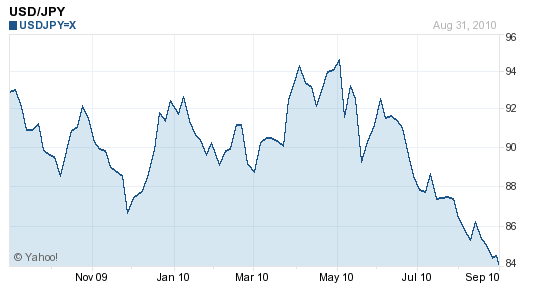 Japan’s exchange rate against the USD dollar is now hovering around a 15 year high. 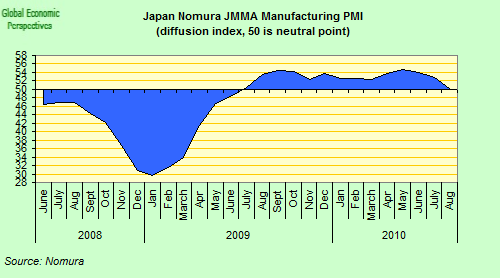 The consequence of this is not hard to predict, while Germany clocks up record exports to China and other parts of the continent, the Japanese “recovery” is gradually grinding to a halt, as the latest manufacturing PMI report only confirms. On thing is clear, the old habits won’t work any better now than they did before 2007, and external deficits which were not sustainable then will not be sustainable now. So we need a new model, a model in which the emerging markets will have a much larger role to play than ever before. And if we are to move towards a more sustainable future, then we need to move beyond those simplistic headlines stressing the virile nature of Germany’s export prowess. There is no doubting the efficacy and competitiveness of many German companies, but for that very reason that country needs to shoulder more of the responsibility for sharing the burden which is involved in finding solutions. Here in Europe we don’t only need sacrifices in the South, some of them also need to be made in the north. German industry is enjoying real and tangible benefits (via artificially low interest rates and an undervalued currency) from the mess that the Greeks created for themselves, but in the interest of all European some of those benefits need to be plowed back in again, since if Greece is allowed to fail, no one will be the winner. My response to him back in January was that maybe we don’t need to look so far afield. Many developing economies badly need cheap and responsible credit lines, and access to state-of-the-art technologies, so why not accept the world is changing, and go for some sort of New Marshall Plan, one capable of generating a win-win dynamic which would be in all our interests? At the time the proposal seemed totally unrealistic and unobtainable. Now, with every day which passes it starts to look essential. And who knows, maybe the rise of a number of other major economic powers would help solve that bipolar currency problem which is currently causing our policymakers so many headaches. Sharing the same currency creates a greater competitive advantage. At the same time, competitors are allies within the same union. These factors cannot continue to co-exist. So, after the world, the EU, the OECD etc. preached the Germans for many years that their workers were too expansive, their labour market too rigid, their education system awfukl (Bachelor/Master vs. Diplom) and their economic model generally belonging to the past, so that they should look to the fabulous service driven economies of the Anglosaxon sphere, they suddenly find themselves in a position where they are asked to pay for everyone else’s mess? Thanks, but no thanks. It is only mainstream America that has been predicting a US recovery, and not necesserily dependent of a dollar devaluation (quite the opposite, we hear more of US strong dollar policy, though in reality most currencies would like to be held low for the moment – something not possible). Those who follow the economy closely have been predicting only a small surge in GDP for all the money lent into circulation in the US. That they have had. Undeniably however a weak euro will help europe somewhat in trade, and make the US less competitive too in that respect, but I think it is a small part of the larger picture. What I find very interesting is a comparison of the currency charts re. China’s peg to the dollar – after all we have the euro valued against the two combined at present. Up until China repegged to the dollar and was following a basket of currencies in its valuation, it started to go exponential vs. the dollar to try to keep its system intact. However it was handling the currency markets, that managed to keep the Yuan (and hence dollar) stable vs. the Euro. Look at what happenned after it repegged to dollar and withdrew its efforts… You may say the following fluctuations were part of the credit crisis etc. but to me are only as far as they were allowed to be by China. Incidentally ‘we’ were in many other countries before moving to China, China as well as sucking in EU production also reduced sectors in neighbouring regions dramatically, textiles in particular. China’s offer , and the convenience of cheaper imports was maybe too good to refuse, I don’t know, it certainly readjusted the flow of money and hence the balance of power and EU direction. Such is the way of global economics maybe, a boom here, then attention shifting to other regions for other reasons etc. etc. though I think this time it has been very overdone. The post from ‘Interesting’ is right maybe, but then why not let all the debt that isn’t likely to be repaid be written off as normally it should be ? Frankly Germany would then be in as much trouble as the rest of Europe (in part due to the debt owed to Germany from the rest of Europe, which Germany ‘knowingly’ lent) and would have to work several yrs all over again maybe to rebuild it finances. So by that score it would be wise for the Germans to look at the system they are part of and have helped to create, knowing they are that much stronger for maintaining a certain amount of domestic manufacturing, maybe. Aren’t the country names in this diagram mistaken? No, since the lines represent relative movements in the spread since 1 January (and not absolute values) they are fine (I think).